It’s no secret that passionate Oregon Duck fans aren’t scared to share their opinion about Marcus Mariota. “The Flying Hawaiian,” who embodies everything that you look for in a leader, and the community of Eugene accepted him as one of their own. It’s also no secret that many have speculated where the Heisman trophy-winning quarterback will land in the upcoming NFL Draft. Some reports have stated that Mariota will play for the Washington Redskins, while others have said that he will play for the New York Jets or the Philadelphia Eagles. The 2015 NFL Draft is still more than a month away, but that hasn’t stopped fans and analysts from speculating where Oregon’s prized quarterback will play next season. 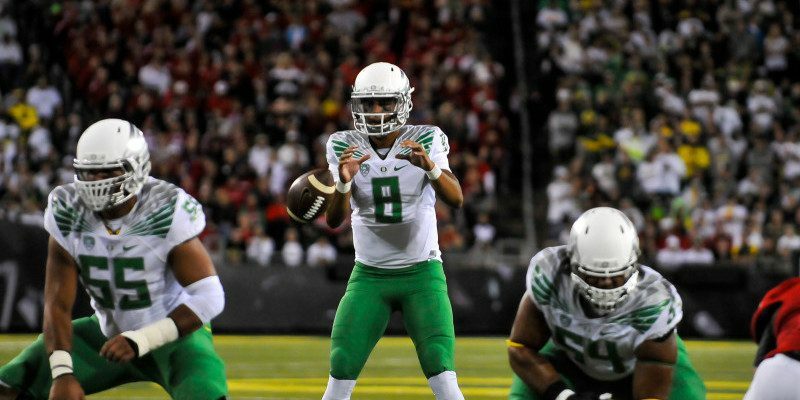 According to ESPN reports, Mariota met with the Tampa Bay Buccaneers on Monday; the Bucs are mulling over the idea of taking Oregon’s quarterback with the first overall pick in the draft. But Mariota isn’t thinking about being the first or tenth pick, though, he simply just wants to play football. Although nothing is imminent, Jason Licht, who is the Buccaneers’ General Manager, attended Mariota’s pro day last week in Eugene. The consensus, however, is that Tampa Bay will draft Jameis Winston, who is a former Heisman winner, as well. There’s no telling what team will select Mariota next month, but it’s clear that the coveted quarterback is ready to make his mark at the next level.